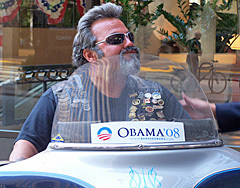 While most delegates opted to fly to Denver for the Democratic National Convention, Mike Underhill of Kenosha took to the road on his Harley Davidson motorcycle. Underhill says he decided to make the trip on his Harley because he didn&apos;t want to take time away from his ride. He says the season where he can be out on the roads is so short in Wisconsin, so this just felt like a natural way to get out on the road. His Harley has over 81,000 miles on it, which he says doesn&apos;t happen by parking it in the garage. The trip of over 1,000 miles took about two days. It was largely uneventful, except for some bad weather in Iowa. Underhill hit rain through most of the state. He says strong winds in Nebraska also made the going difficult at times. While some may expect taking the trip on a Harley would help save some money on gas, Underhill says that wasn&apos;t the case. With higher speed limits in states west of Wisconsin, he was only averaging gas mileage in the low 30s. Despite the weather and length of the trip, Underhill says he&apos;s looking forward to the ride back to Wisconsin after the convention.